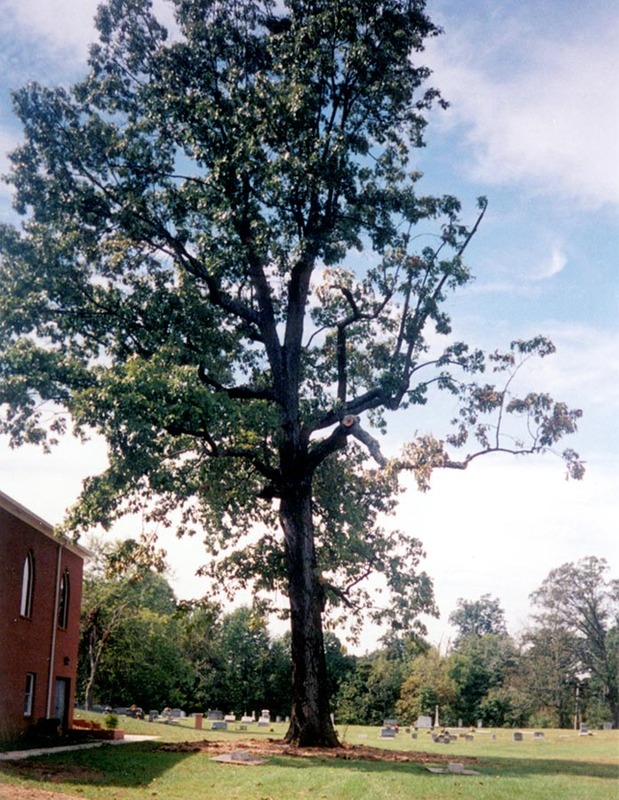 This large black oak was part of a parcel of land given by James Watts in 1844 for construction of the Battle Creek Baptist Church, named for the 1780 Indi an massacre of a group of white settlers on the nearby Battle Creek. The one surviving member of the group, a widow named Betty Jones (grandmother of James Watts), hid in the forest for four days before being rescued by a hunter and taken to safety at Eaton’s Station. The church was organized in 1845 with some of the property utilized as a community cemetery. In 1872, Timothy Demonbreun (son of Jacques Timothy Demonbreun, the first white man to live in Nashville and establish a business), and his wife Mary donated an additional parcel of land for a school house and extra cemetery space. They requested that the land also be used for a Sabbath worship every month for the Methodists, Cumberland Presbyterians, and the Baptists in the community. The property became a meeting place for several churches in the community over the years, and many wagons were tied to the large oak during church gatherings and picnics. The oak was over 183 years old when it began to decline in 2006. It was evaluated as a hazard in 2009 and removed.